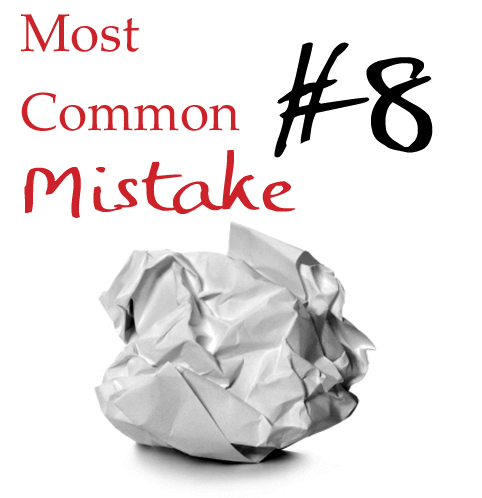 Tell me your opinion: Do you ever find yourself making any of these mistakes? I should be single spacing. Learn something new every day! You’re welcome! It *is* a pain for those who have spent all their lives with double tapping that space bar their thumbs. Blame the software designers! I was raised and educated in the U.S. and was taught to use the punctuation with quotation marks just as @cricketb commented. Interesting. That is interesting. I’ve never run into that in American usage before. There is a party on a block with 10 houses. How likely are you to send your friend to the wrong house? Great explanation. I like little visual and mnemonic tricks. They’ve saved me many a day! Hi K.M., I just had to reply with my own experience. I went to Chicagoland schools and I was also taught the same as cricketb. Something else I noticed is all the journalists and bloggers that use “a” and “an” differently than what I was taught. I was taught to use “an” before words that begin with a vowel or vowel sound, otherwise use “a”. Yes, and to make things even trickier, we pronounce certain words with or without vowel sounds (“herb,” for example), which means some of stick an “an” in front of them and some of us stick an “a” in there. Love this. It took me awhile to learn about ellipses and dialogue/action tags, but learning both have been really instrumental in polishing my writing. All those little tricks of prose seem inconsequential on the surface, but they really are crucial to developing a strong writing style. If the term is replacing the name in a formal way (e.g., “Do you love me, Mother?”), then it should be capitalized. If it’s just a generic term, such as “darling,” it should be lowercase. I often find myself placing semi-colons and and hyphens in my everyday writing, such as forum posts. It’s a habit that I need to try to knock when it comes to fiction, because I have a tendency to write very complex sentences as I try to jam as much information as I can into everything I say. On an internet forum, it doesn’t matter, but I actually find myself trying to rearrange my paragraphs when writing fiction because my natural flow of thought and speech differ from the manner in which I write. As a result, sometimes in first drafts, I go ahead with my habitual method of writing and then rearrange the paragraphs at a later time. It’s tough, though, because the way I write has a certain flow to it. Rearranging these paragraphs disrupts it when I re-read it post-edit. Actually, social media can be a great training ground for writing good sentences. Twitter, especially, is great for learning how to trim fat. I agree with Rebecca, I plan on continuing to put in the extra space because I find it much easier to read. I wish they hadn’t changed the double spaces rule. Yes, I do realize it’s “old school” (however, I did think it was optional). It is my opinion that this started because of web pages. Since HTML removes the extra space (unless it is hard coded using ), it seems to me that people got used to reading that way thus making the change happen. As much as I enjoy the internet I wish this had not changed. Thank you for sharing your knowledge. I always enjoy reading your articles. Certainly nothing wrong with adding that extra space for your own comfort while writing and editing. But I would still advise running a universal search through your document before submitting to an agent, since you’ll want your manuscript to be up to professional standards the first time it’s viewed as a potential for publication. >>Some adjectives end in -ly though. The headline says “-Ly Verbs,” so I assume you know this (even though they’re technically adverbs). What I’m saying is that this is true when the -ly word is an adverb, but it’s not true when the -ly word is an adjective. I did not know that! Thanks for pointing that out. I’ll amend the post. Yes I have made plenty of those mistakes but I have learned so much from others online such as yourself. So should I use commas inside quotes “because” I’m showing the reader what they are doing while the character is speaking? Example: Jennifer leans back in her chair “Yeah Cindy, that’s what John told me,” Tapping the pencil on her face. Is that the correct way and reason? The actions you’re referencing here are called “action beats” (more on them here). They stand as sentences of their own. The only time you would want to separate them from the dialogue with commas is if the action literally applies to how the dialogue is said (e.g., “she screamed”). The correct way to write your excerpt would be: Jennifer leaned back in her chair. “Yeah, Cindy, that’s what John told me.” She tapped the pencil on her face. K.M. – Thank you so much that helps. I can’t tell you how much I appreciate getting useful advise from an established author. Bless you! The quotations are where I have the most trouble. However, I thought when we were talking about things that were not a direct quote, they were not “part of that rule”. Unless you’re British (where the usage is different), all periods go inside the quote marks, regardless of how the quotes are used. Same goes for commas. Thank you for the concise lesson. I find it hard to tell an independent clause from a dependent clause. I seem to put in too many commas. Very interesting… Strucked me kinda funny, that these rules aren’t universal – I mean, that they are right in English, but not in other languages. In Polish, for example, period always goes outside the quotation mark – actually there is a golden rule, that every indicative sentence has to end with period. We have also different rule for listing the items – semicollons are acceptable only in the case of the list of paragraphs. In other circumstances we use commas. Great list. Just wanted to check on the usage of mom as that’s used in my book a lot. Are these right? Great post, K.M. Two quick questions about quotation marks–which of these are correct in American English? 1B. He styled himself “The Savior”. 1D. He styled himself ‘The Savior’. 2A. “How would you feel if people called you “Bwama”?” he asked. 2B. “How would you feel if people called you “Bwama?” ” he asked. 2C. “How would you feel if people called you ‘Bwama’?” he asked. 2D. “How would you feel if people called you ‘Bwama?’ ” he asked. In American usage, 1A and 2C would be correct.